During the last 3 decades I have made a great variety of bows in my workshop from early 17th century copies (very delicate, short and lightweight bows), to bows for the whole range of today's modern instruments. I make bows for the violin family (including double bass), in early, mid and late baroque styles and also in various classical and modern formats. In addition there are viol bows, again in different historical formats. Unlike stringed instruments themselves, bows evolved historically through many different styles, weights, wood types before coming to a more settled pattern in the 19th century. Pick up some of these historical bows and you will find they play very differently one from another. Design characteristics are very subtle; the curve, thicknessing, balance and weight have to be very precise. Historical copying can only go so far; how the bow plays is the final arbiter. I came to bowmaking as a string player (cello and bass viol), mainly involved in teaching and chamber music - especially in the Early Music field (both baroque and classical). Hence the precise playing experience of each bow I make is important to me. As I was trained initially by Arthur Bultitude, my modern bows are broadly in the English tradition with silver faced heads. The playing qualities aimed at are liveliness and expressiveness. You will find detailed information about baroque and classical bows on the Technical Information page. 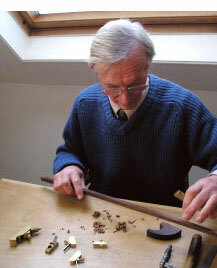 Of the approximately 700 Early Music bows I have made, about 80 have been commissioned by Music Colleges and University Music Departments both in this country and abroad.